This tiny hamlet in the fields on the outskirts of Little Walsingham seems remote enough today, and must have seemed more so until recent decades brought paved roads and electricity. Lonely out here, beside the bubbling River Stiffkey, is a pretty little 14th century building, entirely at home in this landscape. Originally it was a wayside chapel, probably one of several along the pilgrimage routes into Walsingham. Curiously, it sits almost exactly a mile from where the original Holy House was in the grounds of Walsingham Priory. Opposite are sheep, and the ghost of a railway line. Across the river is the medieval parish church, and a cluster of flint and red brick buildings. It is all idyllic. If you had been here before the 1930s, this is all you would have seen. Today, the chapel is backed by a veritable campus of buildings, most of them good ones of the 1980s and 1990s. If you did not know what this was, you might think it the outstation of some Polytechnic or University. A beautiful traceried window looks down on the lane from above the west doors, while at the eastern end a larger window looks out over the shrine gardens. The west window is flanked by two large image niches filled with modern statues. The beauty of the building comes from its heavy buttressing, climbing to pinnacles at each end. When this chapel was built, Walsingham was second only to Canterbury in the ranks of English pilgrimage. The replica of the Holy House, where Mary had received news of her pregnancy from the Angel Gabriel, contained the precious statue of Our Lady of Walsingham. Thousands of people made their way here, down the muddy tracks and over the rolling Norfolk fields. At Houghton St Giles, they would enter the orbit of Walsingham, their goal now almost in sight. It may be that they took off their shoes here, and walked the last stretch barefoot. It might also be the case that this is why it is called the Slipper Chapel. And it may be that it is not true, or even likely, for many of the pilgrims here would probably have been barefoot long before they reached Houghton. Most Norfolk villages are introspective. Around Walsingham, it can feel as if the whole countryside is turned in to face the ruined Abbey. To stand at Houghton today and look towards the village centre can be to sense the presence of a holiness - I am sorry if that sounds trite, or even embarrassing, but I have experienced it myself, and heard other people say the same thing. At the Reformation, the Walsingham shrine was sacked, and the Priory desecrated by Thomas Cromwell's thugs. For several centuries afterwards, this pretty little building served as a barn. Few people can have known of its original purpose. Probably few cared. It wasn't until the 19th century that this began to change. In the 1820s, Catholicism in England was decriminalised. There were still penalties against the full practice of the Faith, but to be a Catholic no longer meant to risk bankruptcy, imprisonment, or even legalised murder. 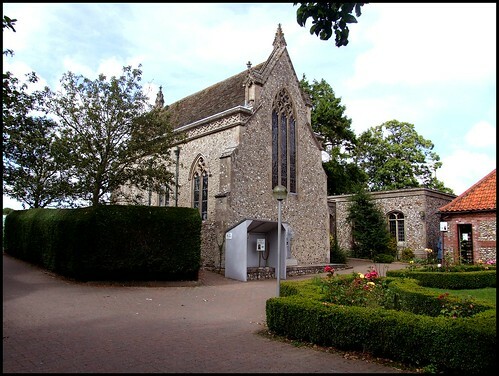 Catholic communities very quickly organised themselves - more Catholic churches were built in East Anglia in the 1830s and 1840s than at at any time up until the 1960s. In 1851, the Catholic Heirarchy was returned to England, meaning that for the first time since the Reformation there were Catholic parishes and dioceses. Walsingham was in the vast, sprawling parish of Kings Lynn, an area of several hundred square miles with, to quote the Lynn Advertiser of the time, barely 150 Catholics, and all of them poor. The parish was placed in the Catholic Diocese of Northampton, a remote town which few parishioners can ever have visited. The church at Kings Lynn was the nearest Catholic church to the Prince of Wales's country retreat at Sandringham. He entertained his guests there, many of whom were Catholics. He encouraged the Parish Priest of Kings Lynn, George Wrigglesworth, to rebuild the church in a more fitting manner - it had been a ramshackle, poky little chapel - and gave fifty guineas of his own money to the cause, about £10,000 in today's money. Wrigglesworth was an antiquarian, and knew much about the history of Catholic and recusant England. 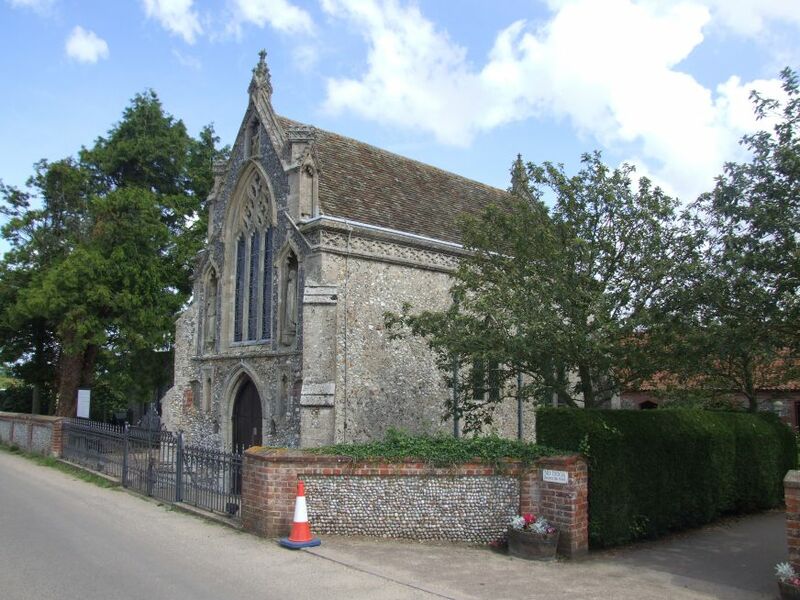 When the church was rebuilt in the 1890s, he added to the side of the sanctuary a long, low, barrel-roofed chapel, which he was dedicated as the Shrine of Our Lady of Walsingham. A statue was ordered from Oberammagau, and carried in procession from the railway station to the church amid great rejoicing. This procession became an annual event, and attracted thousands of Catholics to Kings Lynn each year. One of Wrigglesworth's parishioners was a woman called Charlotte Pearson Boyd. She was a convert to Catholicism from the Church of England, and In 1896 she bought the Houghton Slipper chapel and gave it to the Diocese of Northampton for Catholic use. It should be emphasised that, at this time, there was no Anglo-catholic presence in Walsingham, and no Anglican shrine. Quite what the Bishop of Northampton thought of being given responsibility for an ancient monument in the middle of the Norfolk fields is anyone's guess, but the fact that he gave it to the Monks of Downside Abbey to look after probably tells us a lot. 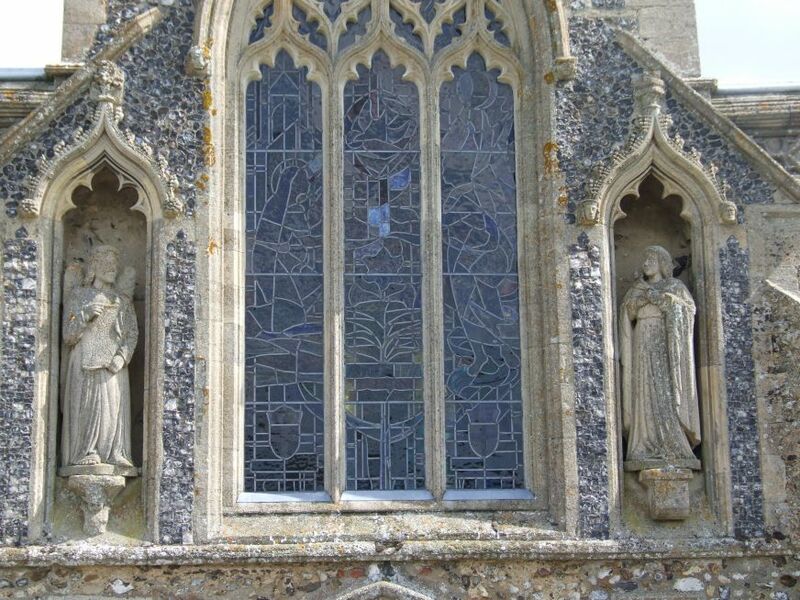 The shrine of Our Lady of Walsingham remained at Kings Lynn, although pilgrimages now became popular, carrying the statue on foot the twenty miles to Houghton, and then bringing it back home on the train. And so things might have remained, if it had not been for the emergence on to the Walsingham scene of one Alfred Hope Patten. In 1921, he became Anglican Vicar of Little Walsingham. A devout and energetic Anglo-catholic, Hope Patten found himself to be the right person in the right place at the right time. Everything came together, in this decade when Anglo-catholicism reached the peak of its influence in the Church of England, and the Church itself was the most vivid it would ever be in the national consciousness. He installed an image of Our Lady of Walsingham in the Anglican parish church of St Mary. Throughout the 1920s, visits to the statue grew in popularity, until thousands of Anglo-catholics each year were coming to pray in the church and to process around it. As you may imagine, the Anglican Bishop of Norwich was outraged, and demanded that Hope Patten remove the image from his church. Hope Patten being the kind of man he was, he acceded to this request by building a new replica of the Holy House on the other side of the Priory ruins, and placing the statue inside it. At last, the Shrine of Our Lady had been returned to Walsingham - but, much to the the chagrin of the Catholic Church, it was an Anglican one. Events then moved pretty quickly. It was imperative for the Church to establish a proper Catholic presence in Walsingham, and in 1934 the Shrine of Our Lady of Walsingham at Kings Lynn was translated by order of the Archbishop of Westminster to the Slipper Chapel at Houghton. Cardinal Bourne himself led the translation pilgrimage, accompanied by Bishop Youens of Northampton and well over ten thousand pilgrims. At the dedication of the new statue (the old one is still in the church at Kings Lynn) he declared the chapel to be the National Shrine of Our Lady. And so it remains today. Four years later, the Chapel of the Holy Spirit was built beside the Slipper Chapel, a place for pilgrims to light candles for their intentions. In the 1930s, most pilgrims would arrive at the Anglican and Catholic shrines by train - Walsingham was on the line between Fakenham and Wells. During World War Two, this was a restricted area, and the Catholic Shrine became particularly adopted by American servicemen. At the end of the War, they paraded the statue into the Priory grounds in the middle of Walsingham, and the first Mass there since the Reformation was celebrated as a thanksgiving for peace. In 1948, there was a great national pilgrimage for peace, and groups of students carried 15 crosses from different places in England and Wales. These crosses now stand in the garden behind the chapel, forming a Way of the Cross. Each year during Holy Week, the Student Cross pilgrimage is repeated. This is an appropriate point to ponder the meaning of Walsingham for English Catholics. Above all else, Walsingham is concerned with the incarnation of Christ, a man fully human, with all that implies. This event occured as a result of the Annunciation, Mary saying 'yes' to the great task required of her. For Catholics, Mary is both a mother and a fellow Christian, perfect in her obedience to the call of Christ, but also perfect in her offering of nurture and protection. Just as the Church is the people, and each member of the Church is Christ to the world, so Mary is the Mother of the Church and the Mother of each of its members. This is fundamental; but Catholics also remember how, for nearly 300 years, the practice of their Faith was illegal in England. Walsingham stands as a reminder of the steadfastness of Mary, and the steadfastness of those who protected the Faith during the long penal years. And there is more - because of the oceans of prayer that have washed across these fields, there is a magic about the very place itself, a holiness to immerse oneself in, a touchstone to the heart of the Christian mystery. For most Catholic pilgrims, there is an urgency about the journey here, a need to feel at the very centre of what it means to live the Faith in England. This helps explain why, even in these cynical days of the early 21st century, any summer weekend will see thousands and thousands of pilgrims making their way here. They come from individual parishes, or dioceses, or societies, or ethnic groups - the national Tamil pilgrimage each July regularly attracts well over six thousand pilgrims, for example. These pilgrimages create huge logistical problems for the Shrine and for Norfolk Police. Pilgrims are encouraged to arrive by coach - there is no railway line anymore - and there is a one way system on the roads around the village. A vast car park has been laid out in the fields to the south of the shrine, like a landing pad for an alien spaceship. And, beside it, is the huge Church of the Reconciliation, built in a Norfolk vernacular style in 1982, the year of the Pope's visit to England. Indeed, it was even hoped that the Pope would come to Walsingham, but such a visit would have been a nightmare for the local authorities. Instead, the statue of Our Lady was taken to Wembley Stadium when the Pope celebrated Mass there. In the 1980s, a network of buildings was put up around the shrine gardens to accomodate offices, a shop, a café and toilets. This is all done well; it is hard for the shrine to blend completely into its surroundings, but in any case the great Church of the Reconciliation overshadows all. The Slipper Chapel remains the heart of the Shrine. Before and after Mass in the great church, pilgrims find their way here to sit in the tiny interior, to pray in the presence of the image of Our Lady. In all the many times I have been here, I have never entered this place and found it empty. Entry is from the east, into the corridor constructed in 1938 along with the Chapel of the Holy Spirit. This leads to a doorway in the north-west corner of the Slipper Chapel. The interior is quiet, calm and simple. The east window of the Assumption is by Geoffrey Webb, the reredos below it by James and Lilian Dagless. The west window is the 1997 work of Alfred Fisher. It depicts the Annunciation, and was installed to mark the centenary of the first post-Reformation pilgrimage to Walsingham. The statue itself is always surrounded by flowers. As I say, this is the heart of Walsingham, the centre of the mystery. It is an extraordinary place. For many people, a visit here is a highly emotional experience. One last detail. Outside, at the east end, is a simple iron cross remembering Charlotte Pearson Boyd, who made it all possible.